Great quality compared to price. Lots of space for two monitors. Cramped space for keyboard and mouse. Keyboard and mouse shelf is not adjustable. This is the summary of consumer reviews for Best Choice Products 36in Height Adjustable Standing Tabletop Desk Sit to Stand Workstation. The BoolPool rating for this product is Excellent, with 4.80 stars, and the price range is $150-$165. Customers ranged from work-at-home entrepreneurs to office buildings each with a wide array of budgets. 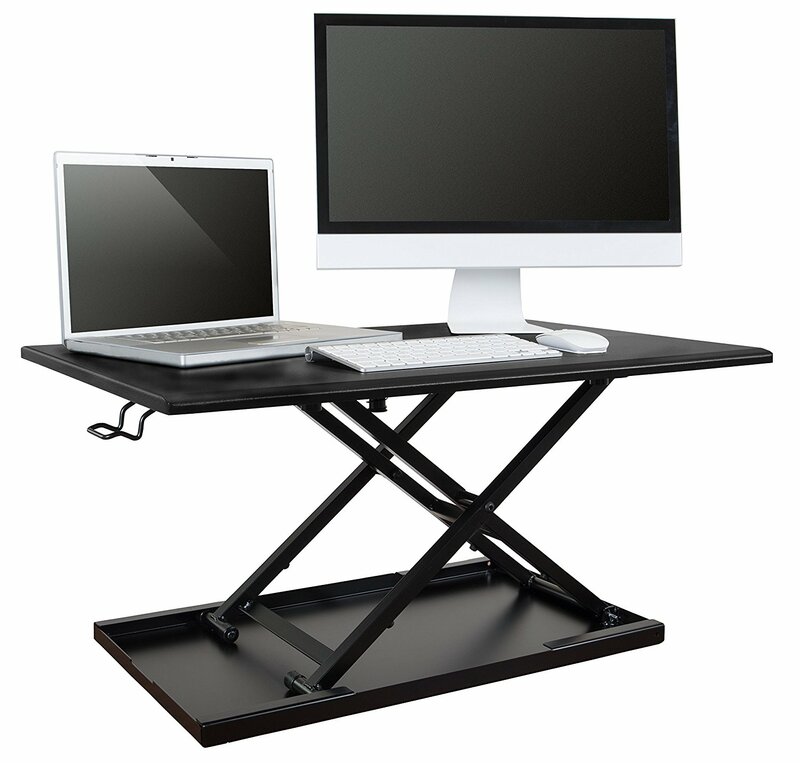 However, most if not all consumers were impressed with the quality of the Best Choice Products Height-Adjustable Standing Tabletop Desk Sitto Stand Workstation especially compared to the price. The top shelf had plenty of room to hold two 27 inch monitors meaning there is room to work and durability for your equipment. Furthermore, customers were also impressed with the delivery. The packaging was secured properly, but most of all, there was no assembly required. Simple take it out of the box and place it on the desk. 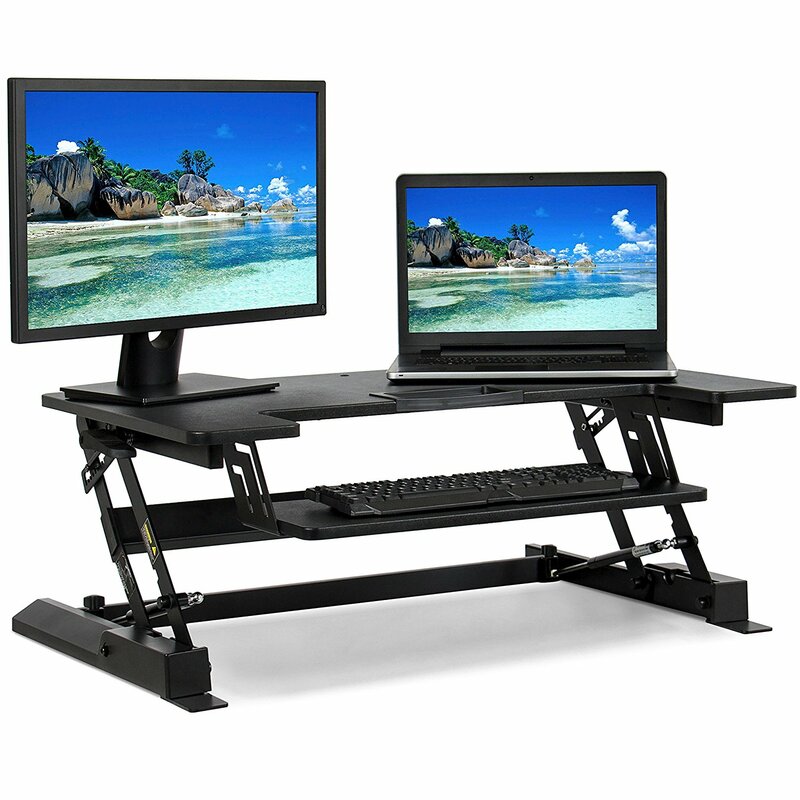 Be cautious though, as this sit-to-stand workstation may be heavy. The only complaint users noted was on the second shelf. 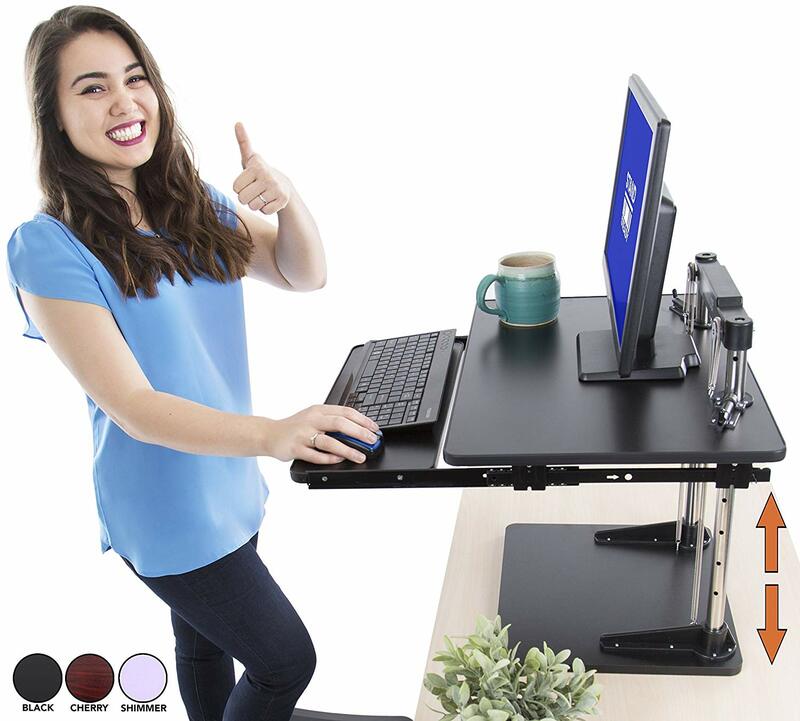 The keyboard and mouse shelf was small for the Best Choice Products Height-Adjustable Standing Tabletop Desk Sit to Stand Workstation. People’s hands felt cramped typing on their desktop computers, and the secondary shelf lacked adjustability. While there is was plenty of space for monitors, hard drives, and notes, this model does not appear to account for the users’ individual preferences. It's very heavy and sturdy. Very sturdy with adequate desktop space, and a great price! Great desk, sturdy and free shipping. It's sturdy, my monitors fit with space to spare, It rises and declines with ease and is comfortable to use. Lots of space on top for two monitors but very little space to use the mouse on the keyboard level. It's a great size and it's very sturdy. Just make sure you've enough space as it opens out. :) At first we were worried about the stability of the desk but it's very sturdy and holds both our monitors without a problem. This desk is so great that I bought two from my office. Quality product and pretty much ready to go outnof the box. This was exactly what i was looking for and the price made it an even better purchase!. Thank you for the promotional discount, which made the purchase even better. My health and energy are better and it fit's my deak perfectly. Purchased two of the standup adjustable desk and love it. 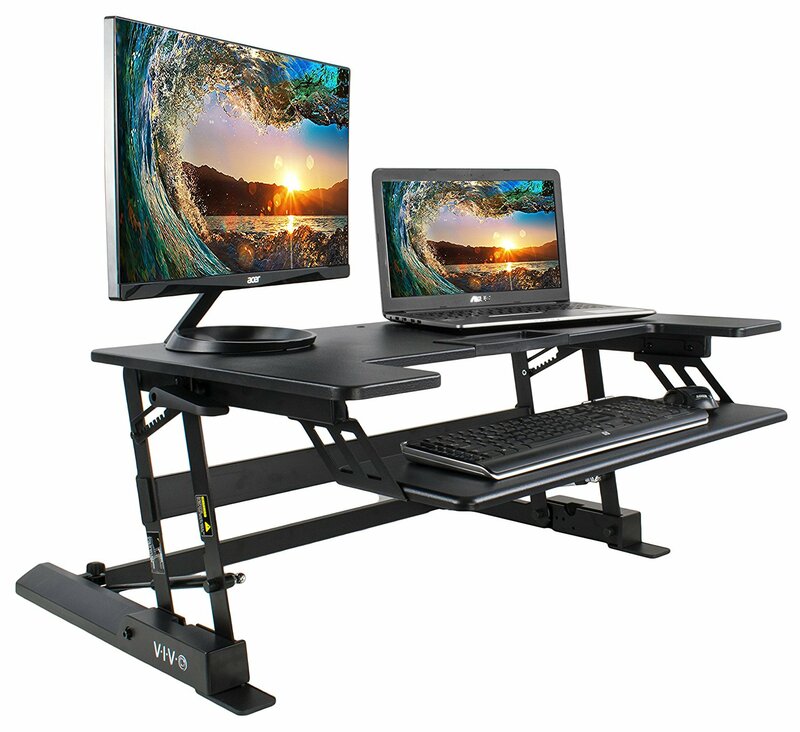 So far I've purchased over 50 of these standing desk and everyone loves them. I'd highly recommend it to anyone that's look Ng for an adjustable desk. I must say that I'm pleasantly surprised by the quality and ease of use. I purchased this standing desk expecting it to be of lesser quality than the more expensive ones on the market. I totally recommend this standing desk!. I'd recommend this product for any office space. I'm tickled pink with this product and highly recommend it! 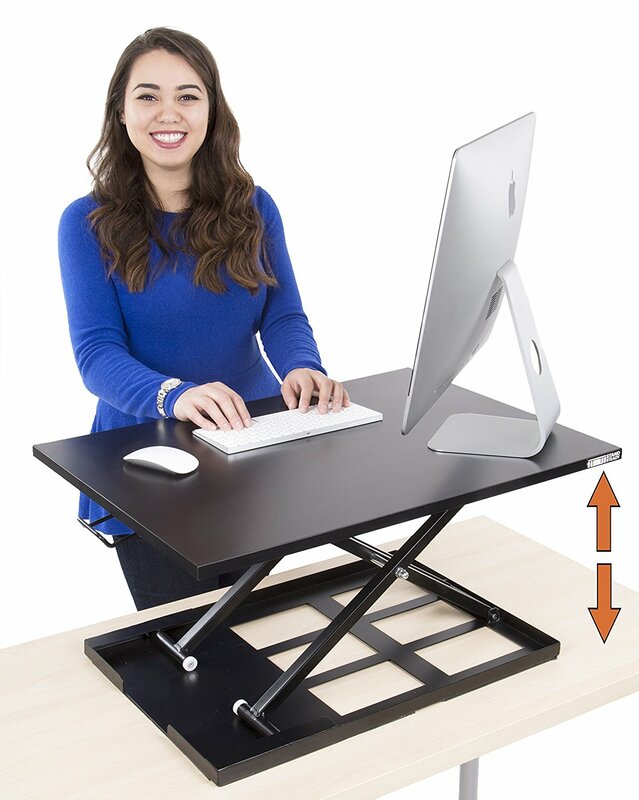 I highly recommend this for anyone wanting to use a standing desk. This product is very good quality and very sturdy. 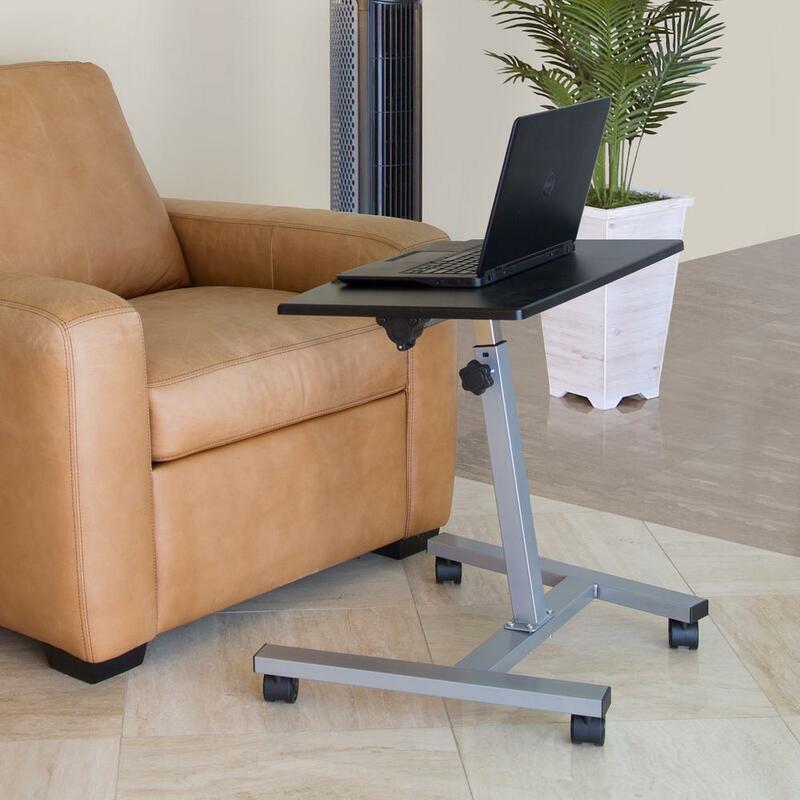 I'd recommend this product to anyone that's interested in looking for a stand up desk . My coworkers were also impressed that all three of them had ordered there own also. I can go on and on but to close out the review, I'd definitely recommend this desk to everyone. Co-workers have paid three times as much for a comparable product. This was recommended by a doctor, to help reduce back pain. The adjust ability of standing desk works well though it was a bit sticky at first. It supports my two 27" iMacs as well. This desk is very solid and looks nice as well. The desk sits well on my existing desk. I thought it was great so I bought myself one as well. The desk and pole are supporting my 2 monitors and laptop well. I also have a different brand at work, it's the more expensive brand, but this desk performs just as well. Packed very well in a very heavy box already assembled. I've been using the stand-up desk for 2 weeks and have made the transition from chair to standing amazingly well. The keyboard tray isn't adjustable, but fits a regular size keyboard and mouse nicely. My one nitpick is that the shelf for keyboard and mouse is a little tight with an extended keyboard. Almost perfect except for the shallow shelf space for a keyboard. I can get enough real estate to move the mouse well enough next to the keyboard without a mouse pad. There's plenty of space for my keyboard and mouse. I've an ergonomic keyboard and there's just not enough room for my small hands (I'm 5'2") I also don't like that I can't move the keyboard tray. There's only one, big drawback.... no room really for the mouse next to the keyboard. About a week later the keyboard rack fell off. The keyboard panel is a little small, but eventually you get used to it. Love it and love the price. I really like this standing desk. I'm really enjoying this desk. REALLY NICE AND EASY TO USE _ VERY WELL PUT TOGETHER_STURDY !! But the mechanism works great, really enjoying the option of standing. I really like this, but it's heavy. This's really a good news. This's a really neat desk to have. - NOT REALLY BIG ENOUGH FOR MY KEYBOARD AND MOUSE - MOVED TO ROLLER BALL_ BUT THAT ISN'T REALLY GOOD FOR MY HANDS _ TRYING TO SAY ERGO AND BENEFICIAL TO MY BODY - WILL HAVE TO GET A TINY MOUSE. I bought this a couple of weeks ago with the main reason of not having to sit all day long at my desk for work (while working from home). Go up a level and it's awkward for your wrist (not impossible, just not really comfortable). It's easy to lift and lower. great quality and easy set up and easy to use. It was easy to set up and is very easy to raise and lower. Adjusting is easy and sits very sturdy. It was easy to put together, easy to put up and down and plenty of room for my office supplies. Excellent Value...very sturdy and easy to lift up and put down. So easy to put up and down.